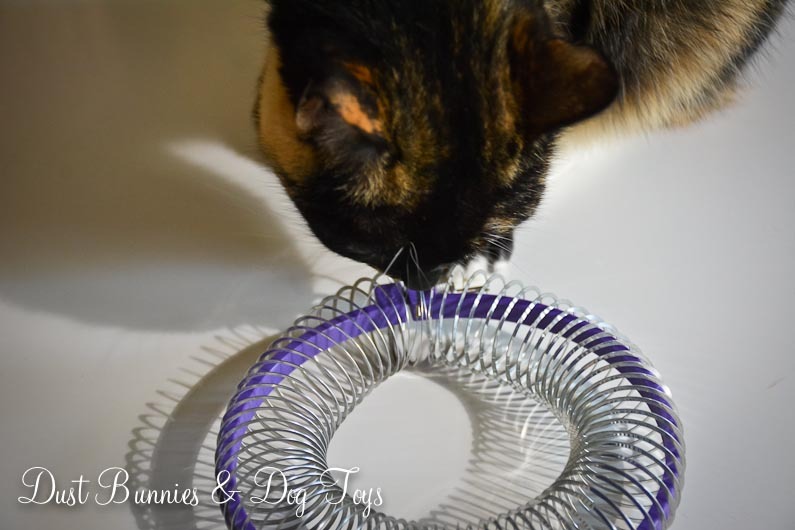 Slinky + Embroidery Hoop = Peanut Squirrel Feeder! When we first put the bird feeder out we had a kamikaze squirrel who took up residence on the branch it hung from and kept up a constant chatter to proclaim his turf. Of course he only wanted the sunflower seeds and would knock everything else out of the way to get to them, thus most of my bird seed mix ended up on the ground wasted. I quite enjoyed watching his aerobatic endeavors and didn’t want to shoo him off, so I decided to make a feeder just for him. 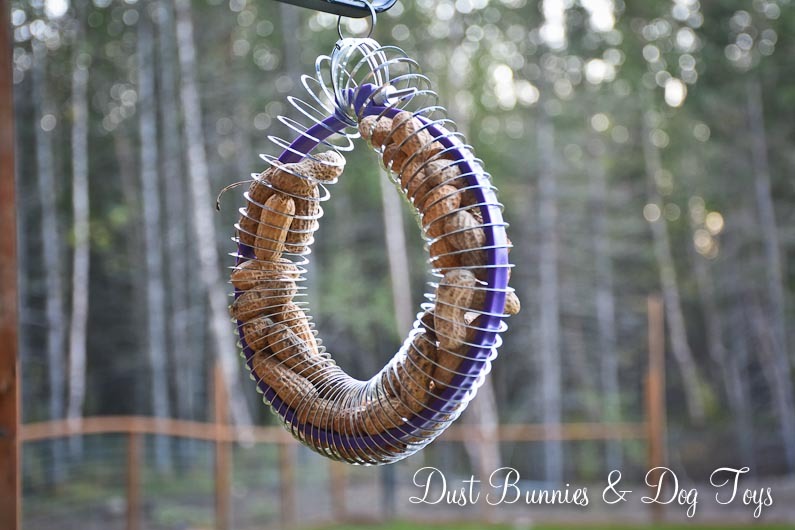 I’d seen metal hoop peanut feeders for WAY too much so I scouted Pinterest until I found a DIY version using a slinky, which I just happened to have thanks to the $1 zone at Target. 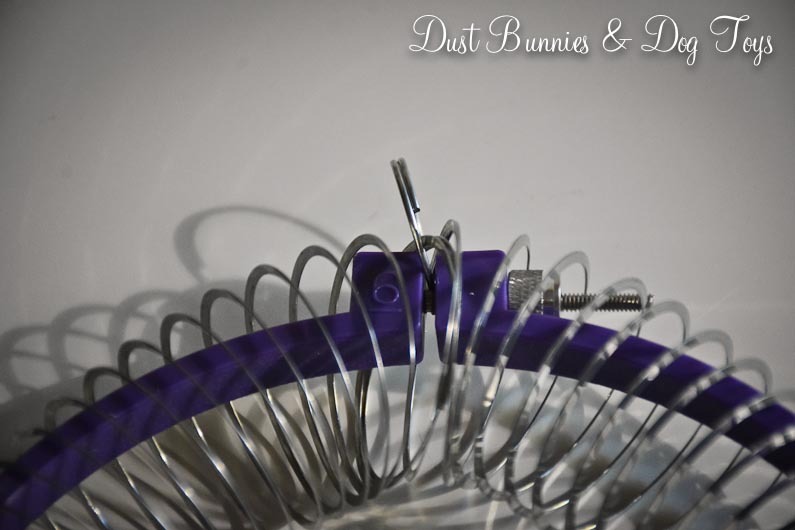 I picked up a small plastic embroidery hoop at Michaels for few buck with a 40% off coupon and paired the two together with a key ring to keep the two ends connected. It was that simple. Although she didn’t offer any assistance or guidance, Luna supervised my work and gave it a good inspection before it was filled. 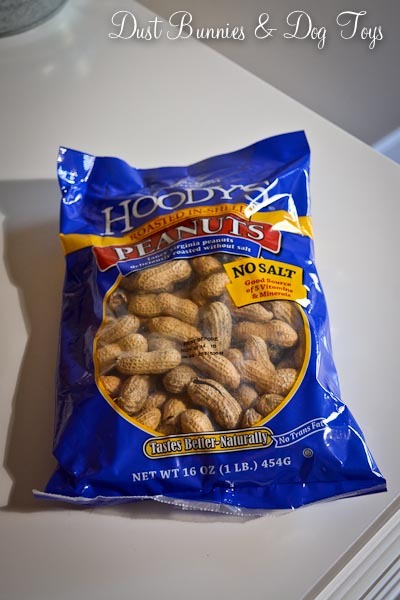 Since I used a small slinky and hoop, I only needed about a half bag of peanuts to fill it completely. 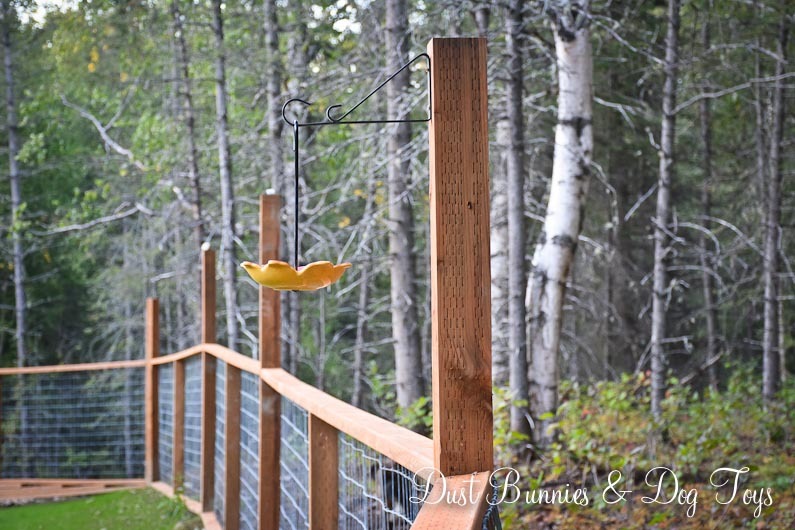 Now that the fence was mostly done I added my plant hooks and hung the feeders from the raised posts. 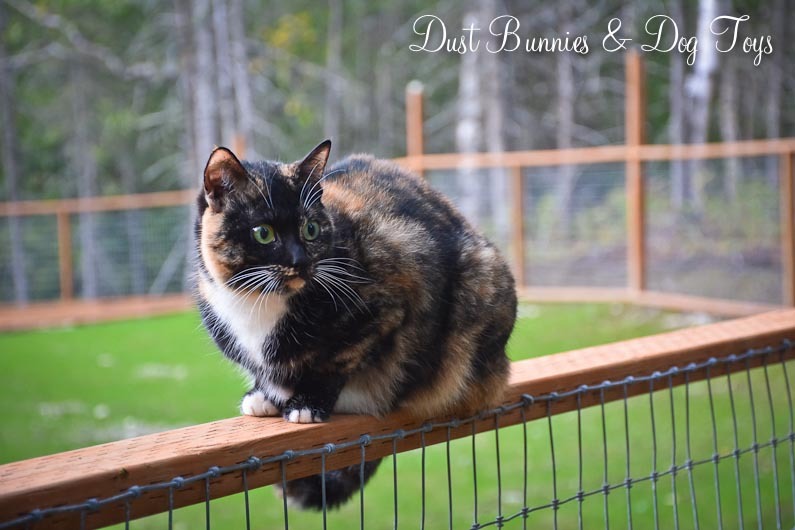 This gives Luna the perfect vantage point to supervise who visits each feeder. And safely watch what her siblings are doing without being in their midst! 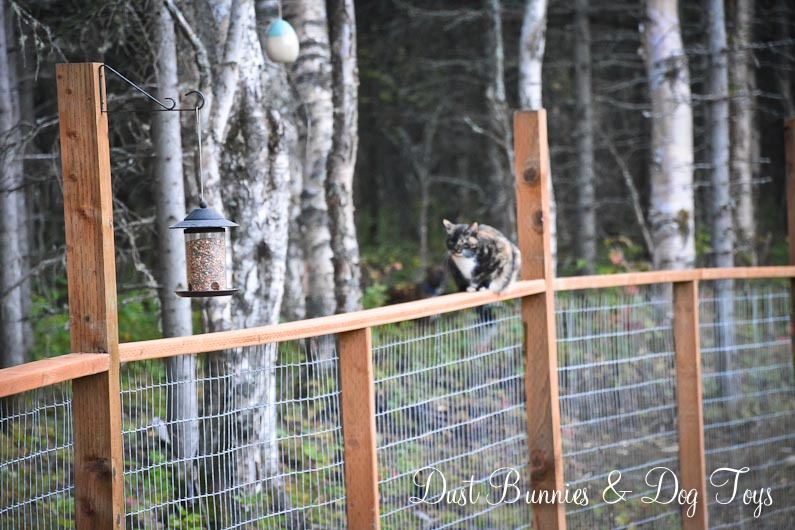 It is pretty funny watching her get to this lookout though – since she can only jump high enough to get her claws in the top board. After that she gets an ab workout hauling herself up. such a great idea! I bet the squirrels love this!